The trucking industry is going through some major changes. With increased demand and retiring drivers, the need for high-quality truckers is greater than ever, and it’s going to cause some major shifts in the industry. What’s behind this trend, and what does it mean to trucking companies? Let’s take a look. According to an October 2015 article posted by The Wall Street Journal, the American Trucking Association (ATA) believes that the trucking industry will need 890,000 new drivers over the next ten years. There will likely be a need for 47,000 drivers in the next year alone, and the study finds that if the economy keeps growing, that number could climb to an overwhelming 73,500! 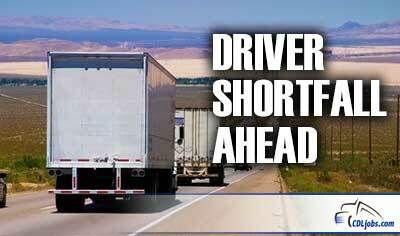 This demand could mean a serious labor shortage for trucking companies. If the estimates hold true and trucking companies do need to hire nearly a million new truckers, that means nearly 45% of the 890,000 would be replacing retiring drivers, while the remaining 55% would be needed to fill rising demand. The Wall Street Journal article also took a closer look at the issue, speaking with Robert Hatchett, the VP of recruiting for Covenant Transport of Chattanooga, Tennessee. Hatchett said that his company would need to hire roughly 3,000 drivers every year to keep up with demand. There is no doubt that the trucking industry is facing a shortfall when it comes to finding qualified drivers, but what is the driving factor behind the increased need? While it is a complex and easily convoluted problem, it really boils down to two issues: an increase in economic growth and a large segment of retiring drivers. After the recession, there was a decrease in demand for shipping, leaving drivers with fewer job options. One result from this decline was that trucking companies found a surplus of drivers. Now that the economy is rolling along, trucking companies have more orders to fill, more miles to drive, and more trucking jobs to offer.. The average age of truck drivers is 49, compared to the national average of 42 among the workforce at large. These truckers will be nearing retirement age much sooner, and they will need to be replaced by qualified candidates. One of the major results expected from the increased demand is an increase in pay, benefits, and driving options. Trucking companies will need to do whatever it takes to bring people into their organization and keep them employed for years. This continued need for drivers will mean offering better pay, whether it’s mileage, signing bonuses, or salary. It will likely mean enhanced options for truckers, including better home time and more flexibility when it comes to scheduling. If the trend continues as the industry evolves, the life of a trucker could be better than ever! If you want to find the most qualified and capable truckers in the country, contact us today. You can be one of the leading trucking companies who find talented truckers using CDLjobs.com!